Today, is the day we lost my sister “Tiny”, and I am asking you to participate in a new tradition. I invite you to participate in a Tiny Angelversary this year and every year on December 8. I have no doubt she would be happy if we did this. See another example of a survivor who changed the day of death for her loved ones. … it is one of my greatest fears that my Daughter and Grandson will be forgotten, my second fear is that they will always be remembered for how they were murdered and I want to change that now to how they lived. On July 26 My daughter and grandson became Angels. From this day forward, this will no longer be referred to as the day they were murdered. July 26 will now be their Angelversary! What I want people to remember is that my daughter was a beautiful, funny, sweet, caring woman who was loved by so many. I want to be remembered for the funny sarcastic sweet girl that she was. She was strong in her beliefs and didn’t fall into cliques at school because she thought they were dumb, and she didn’t like people to be ignored or classified as a geek. She was one of the first people to introduce herself to a new student. She had the best of friends that loved and adored her, and when Louis came along, he was special to all them as well. Victoria wanted to be the best mom there was, and she questioned her ability. But if you ask anyone, she was a great mom. She was smart book-wise, not real good with common sense. But that made her Victoria. She was also a mother who was madly in love with her beautiful baby boy. He was simply an Angel on earth, full of love, smiles, and not a care in the world. He knew how much he was loved. Louis was a ball of love that could not have brought more joy to everyone he came in contact with. His smile makes me smile because that is how I always remember him, smiling. Please take a moment out today to remember my Daughter and Grandson; they are not forgettable. It has taken Rose much longer to begin talking about her grandson. She found a creative way to bring him to life. She wrote a letter as if he were talking to everyone on what would have been his eighth birthday. Loved ones are forever young, as it is hard to imagine them older than the age they were when they were killed. This is a great effort and example here of separating loved ones lives from their deaths. Today I would be 8 years old. I would say how time flies, but I know for my grandparents, family, and friends, it hasn’t been anything but a long, drawn-out, living hell. I want them and everyone else to know I am okay and happy to be home. I am with my mom and that made leaving all of you a little easier. Please don’t be sad for us; we will see you all again. My grandma helped me write this! She wants everyone to listen to this song by Kenny Chesney called “Who You’d be Today,” because it keeps playing over and over in her head. I guess it reminds her of us. The words in this song that Rose tells us about may fit many of you. The lyrics acknowledge that loved ones are gone while inviting you to imagine their future. Recalling memories like these are medicinal when they give life and meaning. Over time you may be able to separate the memories of their lives and their deaths more and more. Today or sometime this month, I ask you to consider a donation to the books or services for Survivors of Violent Loss. I ask you to make a donation, in Tiny’s name. This money will go where you want it to go. 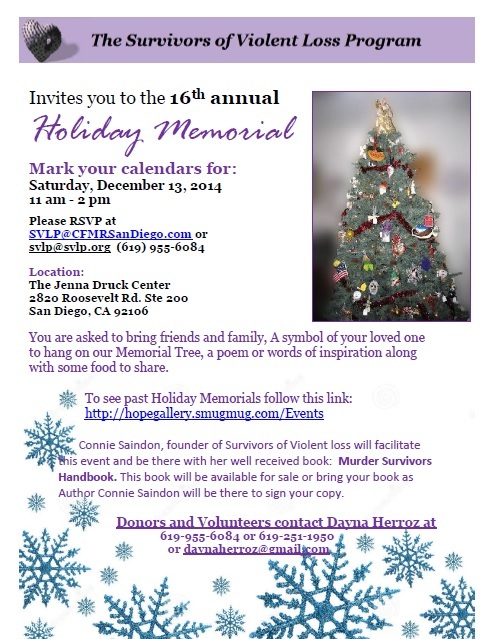 A book, services or remembrance events for survivors. Here is a link to donate by PayPal or your credit card. All donations no matter how small will go towards making a difference in the lives who have lost someone to murder. The other part of this is that I ask you to send this link to others that you think may be interested.